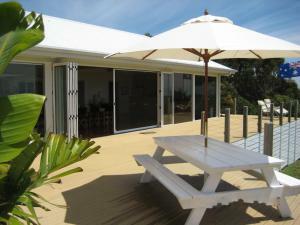 Very spacious, well-equipped house with a wonderful sea view. Perfect for a weekend away. Ted the owner was a very attentive host. We only wish we could have stayed a little longer. Thanks Ted for everything! We like the garden and the beach view! It's rather amazing! Also luckily we saw groups of kangaroos outside the house when night is getting dark. The location & the view was spectacular. The sunrises and sunsets was breathtaking! Very attentive & helpful host. Most Unforgettable stay! We will be back! Thank you again for your hospitality! 1) The house location is conveniently less than 9 km from Wilson's Promontory national park entrance; 2) The house is on a large quiet and peaceful rural property with breathtaking view of the Yanakie bay and the national park; 3) The house has got modern decoration and on-suite facilities for all four bedrooms; 4) The host Ted was very friendly and helpful. The view is amazing. Really breath taking. The kitchen has everything you need and the fire place was the cherry on top! Easy access to Wilson's Prom. We loved watching the birds and saw some kangaroos in the distance in the neighbouring field. Would recommend staying. Ted and his wife were great. Always prompt with communication and very accommodating. The location and view from the property are amazing. 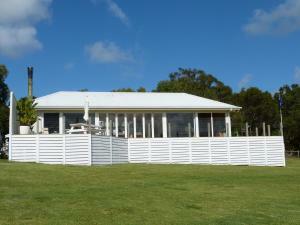 The kitchen is well equipped and the house is spacious with ensuite bathrooms to each bed room. Amazing is the word! The location, the property, the wildlife, the experience. Even though I've paid to stay at the property I feel I need to say a huge thank you to the owners for the experience! Was hard to leave.....the best trip I've ever had to the Prom! Beautiful, well appointed home in a magnificent position with the most amazing view. Sunrises and sunsets were stunning. A nice quiet area, a close walk to water. Nature all around. The home had a big garden great for children to enjoy. Would definately come back. Absolutely fantastic property. 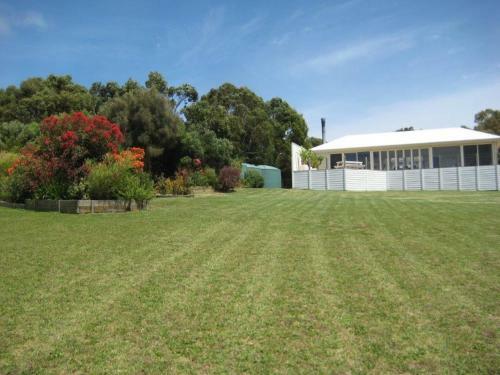 Great house with exceptional views and a big garden for young kids to run around. Perfect place to wind down and relax in the peaceful surroundings. Hosts were very attentive and extremely friendly. Highly recommended. 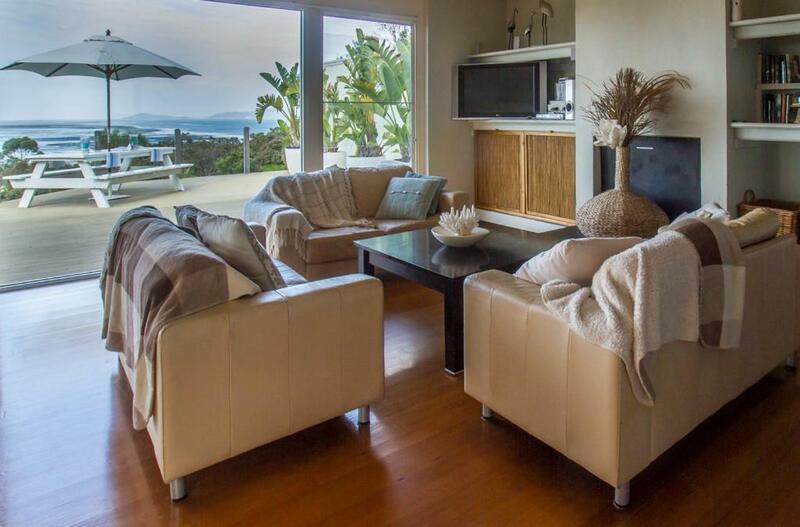 Lock in a great price for A Promontory View Beach House – rated 8.9 by recent guests! 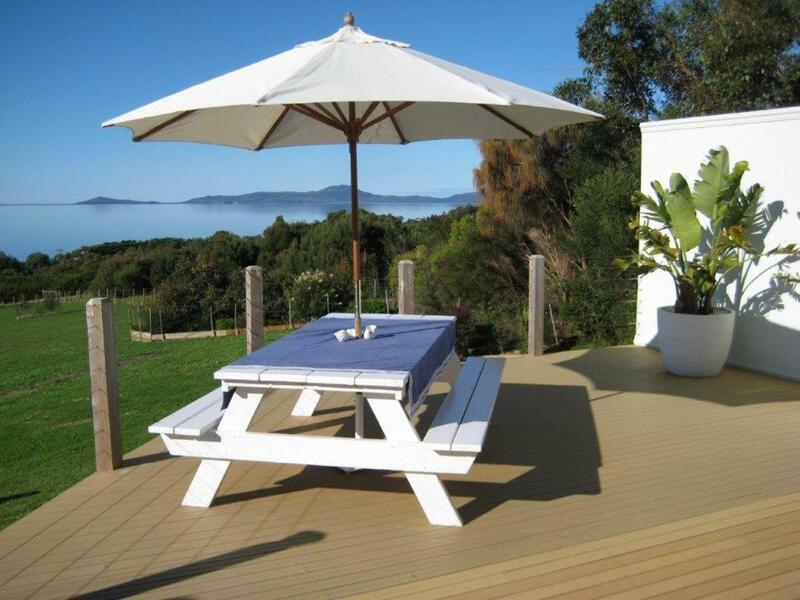 Set in Yanakie, this 4-bedroom holiday home features a deck with sea views. The unit is 2.5 mi from Wilsons Promontory National Park. The kitchen is equipped with a dishwasher and an oven, as well as a coffee machine and a kettle. A flat-screen TV, as well as an iPod docking station are offered. Other facilities at A Promontory View include a barbecue. Each queen bedroom has a private ensuite with shower, toilet and vanity. The spacious living room features floor to ceiling doors, a bar and fireplace. 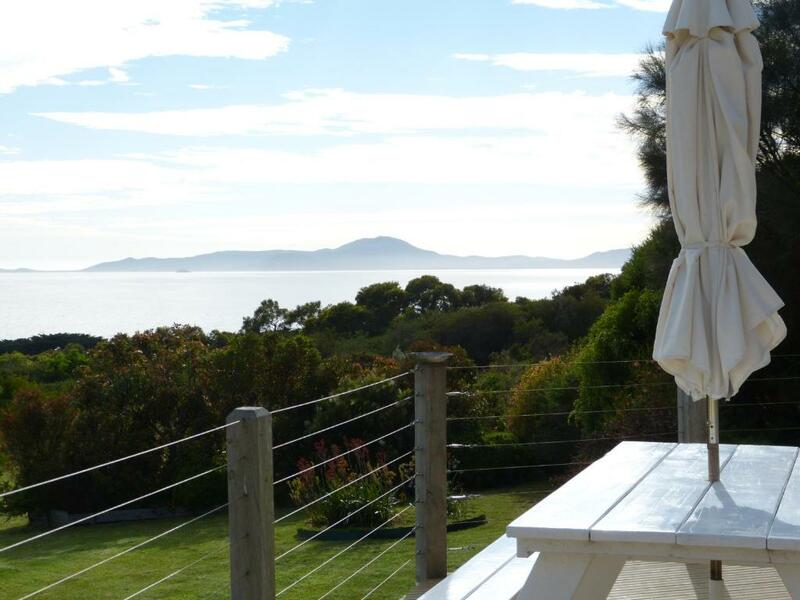 When would you like to stay at A Promontory View Beach House? This large modern holiday house has 4 bedrooms, each with a private private bathroom. There is a 120 square yard living/dining room with floor-to-ceiling windows opening onto a large deck with deck with 180 degree sea views. There is a full kitchen and a covered outdoor area with a BBQ. Large Modern 4 bedroom waterfront Beach House with 180deg. expansive sea view across Corner Inlet to the mountains of the Prom. Perfect for 4 couples, a group of friends or 1 or 2 families. A great base from which to explore the fabulous beaches & walks of the Prom. National Park - Park Gate only 4 mins. away. The house has 4 QS bedrooms each with own ensuite. Stylish furnishings, fully equipped wet bar, huge open fire (in season) with Leather couches surrounding. Large screen TV , DVD/CD , movies provided, Bose Soundock for Ipod/phone/pad. Complete kitchen - Dishwashers (2) ,Microwave, Oven & Hotplates,,Lge fridge all necessary cutlery & crockery,Coffee plungers. Pod machine , kettle ,Toaster etc. Large communal table (8) The spacious living room (120m2) has cathedral ceilings and the entire frontage is full height glass opening onto the full width deck overlooking the inlet. The enclosed glazed rear atrium has a gas BBQ and seating. Many bush & beach walks from the house. The 2 acre landscaped garden is abundant with native plants & birds. Sunrises / Moon rises are spectacular over the water. 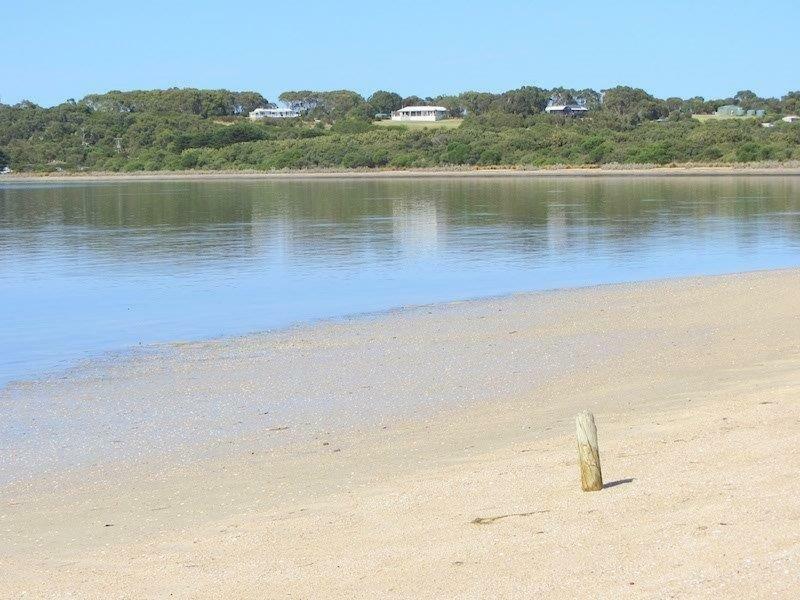 Boat ramp access is 200 mtrs to popular fishing in the inlet. I have been walking/ boating/ diving/ Fishing the Prom for many years and never tire of it. The beaches and bush walks etc are the equal of any in OZ. We built the house ourselves , very close to the Prom , and enjoy it as often as possible. The close by Wilson Prom. National park is of course the highlight . There are many other nearby attractions - Cape Liptrap, Waratah Bay, Walkerville, Shallow Inlet, Fish Creek & Foster with arthouses , pub & Cafes, shopping & markets. Excellent wineries serving lunches & tastings. Golf Courses etc. House Rules A Promontory View Beach House takes special requests – add in the next step! Please note that bed linen is not included in the price. You can rent it at the property for AUD 25 per bed, or bring your own. Please note this property does not accept payment via credit card. You must pay via bank transfer. Cleanliness wasn’t up to scratch, lid on bin broken. 1) There isn't fixed-access Internet / WiFi service provided. Thus, you will need to ensure that you have sufficient Mobile Internet data; 2) You will need to take your clothes back home for washing (during Summer months? ), as rain water is the source of water supply. The floors, particularly the bathrooms, were not quite as clean as they could have been. We swept the bathrooms when we arrived and problem solved. 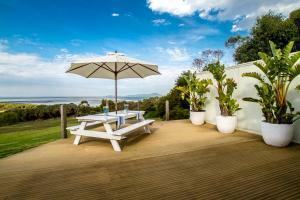 Spectacular views and spacious accommodation. Kitchen and bar area had everything required to prepare all meals for a few days. Lawn, gardens and small pond was great for kids to explore. Was comfortable for a short stay. Excellent location to explore the Prom and surrounding area. One of the most beautiful parts of Victoria. The towels and bed sheets weee not included in the price. We have to add 100 dollars extra money for this service. It is not mentioned in the Booking Add. Cleanliness is a problem in the property. Reading other comments and the owners replies highlights that there is not one common understanding of what's considered clean. The toilets seemed to have been sprayed with toilet cleaner for years but never cleaned and sticky and dirty. We have a baby and a toddler and they were picking stuff up from the floor and there were black long hairs everywhere. Also lots of insects we needed to get rid of on arrival (Mainly lots of dead flies and spiders) Only a couple of days before the stay I received information that linen were not included in the stay. I was already on a round trip with family by that time and this was very inconvenient. I would have also appreciated to be informed before payment as this might have changed what property we booked. The owner provided us with linen without extra charge (usually they charge 100$) which seemed cleaned but had several stains. We only needed two bedrooms but we were lucky as two of the beds had blood stains and other stains on the mattress cover and therefore were unusable. The fire wood provided doesn't seem to be capable to heat up the living space which was quite chilly and some of the heat blankets weren't working. This was all very disappointing having family from overseas visiting and the state of the property spoilt this trip quite a bit. I would have prefered to have paid extra and have all linen provided. When booking I didn't realize that it wasn't. (My fault, didn't read the fine print) Also the magnificent living area was quite hard to heat and used a lot of wood which is an extra cost as not a lot was supplied. Oil heaters in each bedroom and electric blankets were good.